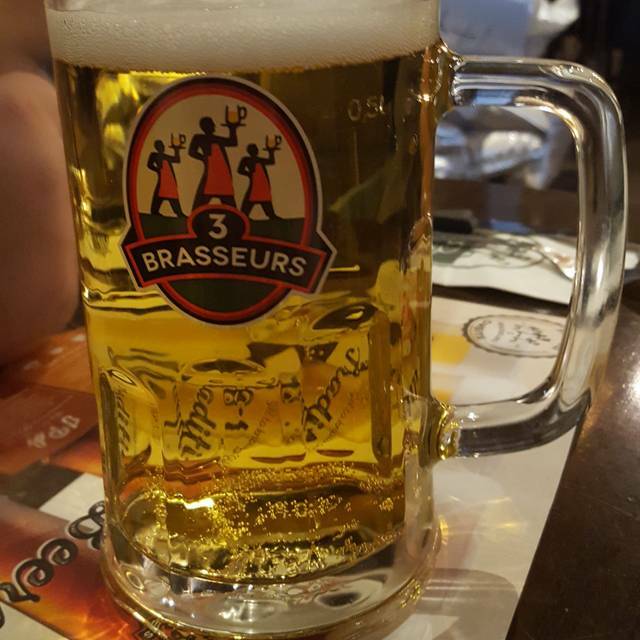 3 Brewers Kanata is located at the Kanata Centrum Shopping Centre. We are a microbrewery / restaurant with 2 floors of great dining and 2 bars. A great place to watch the game on the big screen, relax after shopping or having dinner with a beer before or after a movie. We have a double decker patio with a great view overlooking the promenade. 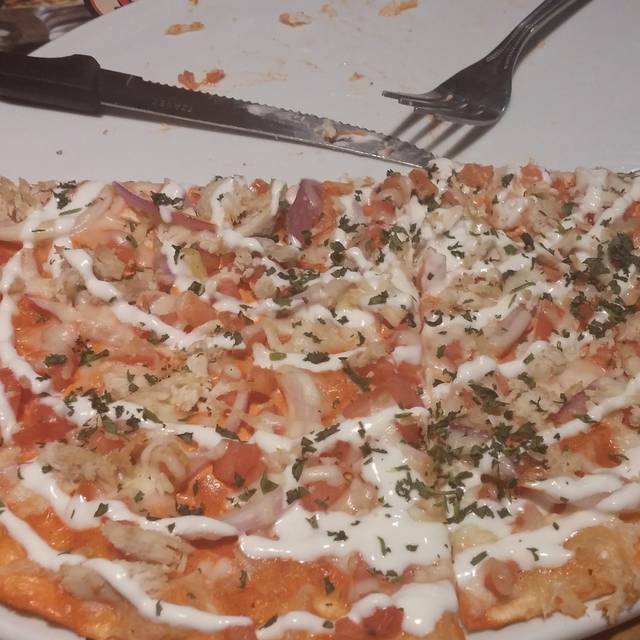 All of our beer is brewed on site and our menu has great variety featuring our famous flammekueches (alsation flatbread). Good place but service was little bit slow. Took 20 minutes before anybody take our order for a drink and the place was not pack. Was there to celebrate St. Patrick's day and Tyler was our server. Was there just before noon. The place was not crowded and we took our time with a few beers before ordering lunch. Tyler was very attentive and looked after us very well. I had the bacon cheeseburger with max fries which was an add on for 2.50$. My only complaint. Get rid of the little baskets to hold the fries and give a good serving of fries! The prices for the burgers are pricey but not any better than anywhere else. And for the price I paid, I should not have been left wanting more fries and feeling a bit ripped off for paying the add on. Bill for the wife and I .... 4beers, two shots, two lunch items and 1 dessert 120.00$ with tip. Should not be complaining about a side dish. No problem with the prices just make sure your customers are leaving a few fries on the plate then you know the portion is good. All other parts of the experience were very good, would recommend and will return. Met up with friends before the hockey game. Was a great atmosphere and the staff was very accommodating and friendly. Food was really good. The only real problem was when we were finished it got real busy and it was hard to get the waiter's attention to pay and leave. Had a good time here ..place was not busy which was good for us with big group. Dissapointed you cannot buy any craft beer to take ?? No shop to buy merchandise ? Not good !!! We love the back room and wish that there was some way to block out the noise from the restaurant because it is a business networking meeting. Our servers are always excellent! Amazing experience. Great good. Great beer. Great service. Great value and quick supper after movie with very attentive service. We waited over an hour for our meals, which were very simple in nature. Server friendly but we had issues. Partners ribs arrived cold, not warm, not cool, but cold. Sent them back . Replacement meal arrived same time as the other couple and I were paying the bill. I ordered steak frites but no fries and a Caesar salad. Meal delivered was steak with fries and house salad. Kept it so not to create difficulty as we were a group of four. Then my wife's ribs stone cold. All together food experience not good. Ambiance and friends great. Myself, family and friends decided to book a table at your restaurant New Year Day for dinner. I must say we were rather disappointed, having to wait 1 1/2- 2 hours for our meal to be served and found the serving sizes rather small for the price. All in all our experience with 3 brewers was rather disappointing and not certain myself or others will return for another meal. I consider 1 1/2 - 2hours a bit too long to wait for a meal and the meal was not very warm when brought to the table. I must say it was a very disappointing experience. We were very disappointed in our experience on New Year's Eve at the 3 Brewers. This was our 3rd New Year's at this restaurant but it was also our last. Our individual server was very nice and very apologetic when our orders were mixed up - not her fault. Our salads/appetizers cam at the same time as our meal. Not all of the modifications requested were done - ie fries instead of salad. The steaks were cold. The peppercorn sauce was cold. Parts of the order were missing and the meal almost finished before the missing side dish was served. Long wait for our food. We waited over 30 minutes. The staff were nice but didn’ come overmuch to see how we were doing. It wasn’t that busy for a New Years Eve. Next year we will go somewhere else to celebrate . I really enjoyed the food but the noise level was too loud. Very friendly and attentive service! I would recommend this place. The home brewed beer was very good. Really excellent server! He was engaging and helpful with our menu selections. Good food, good service, and our table was immediately ready on a busy night at a busy time. Well done. Very slow.. It was just over an hour from when we sat down til when we got our food. Waitress was very eager to take our orders but sidnt reall check up. While we waited for our food. Food is good alway has been. The atmosphere and decore are great. Great spot for dinner before a movie just make sure tou give your self time!!! The mussels were a bit old tasting but otherwise, everything was great. Fun place for dinner before going to the movies- in fact they now have a dinner , beer and a movie deal that is a good bargain. Service is fast and friendly, beer is cold and fresh , food is upmarket bar menu. Not a place for intimate dinner and conversation as the noise level is always pretty high. Not a bad place for a pre-game meal. The "Triton" beer pitcher was a bit of a waste - the spouts were leaking, and they put ice on top? For some reason? This would only keep the air cool, not the beer! Food was good - the poutine with maxi fries was delicious. The signature "Flammes" are tasty. The ambiance was OK - expected more from a brewpub but it was fine. Recommended for a quick pre-game meal. Awesome service and food. Great experience. The server was attentive and made great suggestions. Our beer glasses were never empty! Loved the drink selection and wide variety of food choices. Our family group of 11 thoroughly enjoyed our evening at The 3 Brewers. Our ages ranged from 19 to 87. We sat at a long high table in the middle of the restaurant with plenty of room that allowed us to get up and visit with others at the end of the table while we waited for our food to arrive. The food was delicious, especially the Flammekueche and the waitress was very friendly and patient given our group size. We will definitely be back. We were celebrating our friends birthday and the waiter was more than excited to celebrate with us! We had a blast. Food was great, atmosphere was also great. i spent the time there working while kids were at a movie. for me, it was perfect. Staff was great. Easy to book online. Immediate confirmation. We were celebrating a birthday and the waitress was very obliging to bring a desert with a sparkler to surprise my sister. We did not feel rushed to leave and chatted over our meal and for a bit afterwards too. Thank you. I made reservations (online) for a group of 12 (for my 26th birthday) two weeks in advance and I even got two emails confirming my reservation. When we showed up the hostess claimed to have no reservation for our group. Luckily it was dead in there so we still got the big table in the back room. We were not being served and we wanted to order drinks so we moved to a high top table closer to the main bar (just to get our drinks). Pretty ridiculous when you're the only people in the entire restaurant... Food and drinks were good but the lack of organization has deterred me from going back. The beer was excellent along with the hot Italian saussage in the pizza that I had ordered were outstanding. We were visiting Ottawa from out of town and were staying near by at a hotel and were recommended this restaurant. We came to celebrate a friends 30th birthday and had put this in the notes when I made the reservation, we also told our waitress, the end of the meal came and there was no dessert brought out (which is pretty standard for any restaurant) and nothing special done for our friend. We weren't even offered a dessert menu so that we could choose something to purchase to her. Safe to say it was a let down expecting after relaying twice we were there for a special occasion that nothing was done. The food was also mediocre for the price. We will unfortunately not be returning. The first thing I noticed was a very nice, relaxed atmosphere. We were seated fairly quickly ( had a reservation). We were served quickly, but not rushed. Menu and drink options were well explained to us by a very pleasant server. The onlu issue was that my med-rare steak was very well done. I didn't return it, but ate it anyway. It was fine, just not cooked how I ordered it. When our server found out, she discounted our meal, which I thought was very nice. Overall a very pleasant experience. I will come back. Attended with my four children for the s’mores campfire on the menu... was excellent! What a great and unique idea. Need to expand drink menu for kids as did not have chocolate milk or rootbeer and they ran out of pizza which my younger child wished to have. However, that was all fine and the campfire s’mores made up for it! Fantastic time and waiter was great. Was very loud and could not hear people that I was sitting with. Had the 2 piece fish and chips - one piece of fish was good the other was so fried that there was no fish left - same happened for 3 people at the table. Always great experience whenever we go. Good service. Good food. Reasonable prices. Make a reservation and avoid the line-up. Really good food. Started with the pretzel and wow the Dijon mustard has a surprise taste...not in a bad way. Yep of us enjoyed the three brewers burger. Very good meal. Our server was great, and our meals were topnotch. The menu has been revised since my last visit and was very very enticing. Enjoyed it so much, a great place to meet up for food, drinks and laughter! Our only “issue” was that the server stacked the plates in front of us...I mean right in front of us...move out of the way while I place the dishes in front of you and scrape the food off other dishes in your place setting!! !